GREENVILLE — Erik Martin, a reporter for The Daily Advocate, has released his first published book. Martin, who writes under the pen name “E. Scott Martin,” has authored “Four Questions: A Novella.” The fictional work, 152 pages in length, is available for order on Amazon in paperback and Kindle editions. “Four Questions” tells the story of Heath Hawkins, a small-town newspaper reporter in rural Virginia. His everyday life is mostly uneventful, but after an encounter with a mysterious entity in his dreams, Heath starts to uncover the truth behind a number of mysteries, and most importantly, comes to terms with a longstanding mystery of his own. Ultimately, he finds the pursuit of truth, while rewarding, can be costly. Martin said the book combines a number of literary genres, including murder mystery, the supernatural, small-town humor and some romance. As a newspaper reporter for The Daily Advocate, Martin said it was a comfortable fit to use a small-town reporter as the protagonist of his first book. What primary message should readers take away from “Four Questions?” Martin said it is the idea that common people can accomplish big things, through determination and a little luck. Martin graduated from Huntington University with a Bachelor of Arts Degree in English in 1994. Prior to his work for The Daily Advocate, Martin worked as editor of Coin Values Magazine and as a writer for Coin World Magazine. He currently resides in West Milton with his wife, Jennifer, and their youngest daughter, Emery. His son, Jared Martin, is attending Sinclair Community College in Dayton and his oldest daughter, Madeline Lightcap, works as a pharmacy technician in Enon. 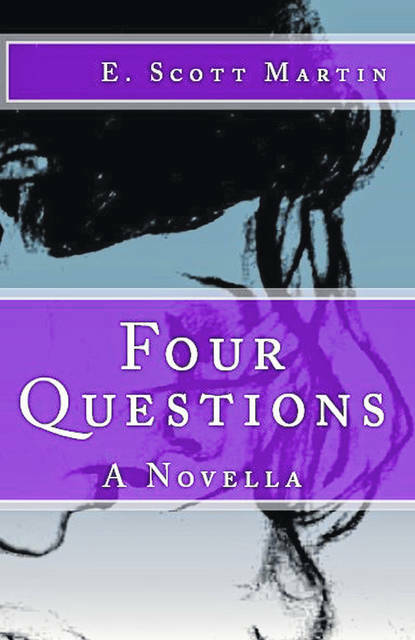 “Four Questions: A Novella” is available in paperback and Kindle editions. It can be found online at https://amzn.to/2My8aB0.